Robotic Tips | Tamar Laboratory Supplies LTD.
QSP began manufacturing Liquid-Level Sensing Tips some five years ago for a very progressive automated liquid handling equipment manufacturer, who was working on a new concept. Today, many well known systems are being equipped to use disposable tips in addition to washable probes. Disposable tips are necessary for critical assays where zero carry-over is imperative. 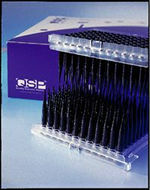 Although standard polypropylene pipet tips can be used with some systems, the majority require tips manufactured of carbon black-conductive polypropylene. This highly conductive material is necessary to detect the presence or absence of sufficient liquid, in order to avoid short sampling and excessive submersion of the tip during aspiration. QSP’s Liquid-Level Sensing Tips are specifically manufactured for this purpose. To achieve optimal fit and function with the various standard and customized automated liquid handling systems, QSP offers a wide selection of Liquid-Level Sensing Tips ranging in volumes from 10ul to 1000ul. Some automated liquid handling systems require more force than ordinary pipettors to seat the tips. The additional force can cause flexing in the rack and therefore improper seating of the tips. QSP’s heavy duty rack features 96 full height individual inner compartments which provide the additional stability needed. As an added benefit, these inner compartments serve to keep the tips separated from each other, thus eliminating the possibility of cross contamination.